‘Orientation – maquette for a monument to the honeybee’ is a small-scale art project initially designed for Agrikultura- a temporary outdoor exhibition run in Malmö, Sweden in summer 2017. 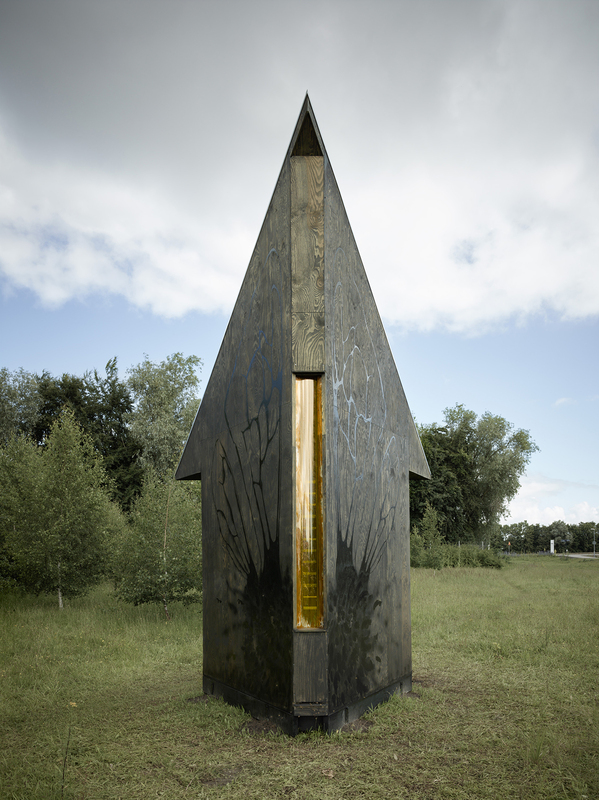 The work – presented as a full-scale maquette – can be seen as a warning from the future, it incorporates its own colony of bees, indicating that the construction of a final memorial is not yet necessary. The structure is simultaneously a ‘potential memorial’ for the bees, and a celebration of the sun on which all life depends. The piece makes specific reference to the marvellous and mysterious components of bee orientation: verticality (gravity); geometry (beehive cell structure); and the position of the sun relative to the hive. The project also refers to the mortal threat to the global bee population from certain insecticides with which seeds are treated. These can interrupt the neural orientation processes by which bees find their food and is currently leading to a crisis in bee populations which also threatens human food production, since one third of human food is bee-pollinated. As an enigmatic object in the landscape, the building has a brooding presence. The roof is clad in reflective metal and points to the sun at solar noon, reflecting the sky. 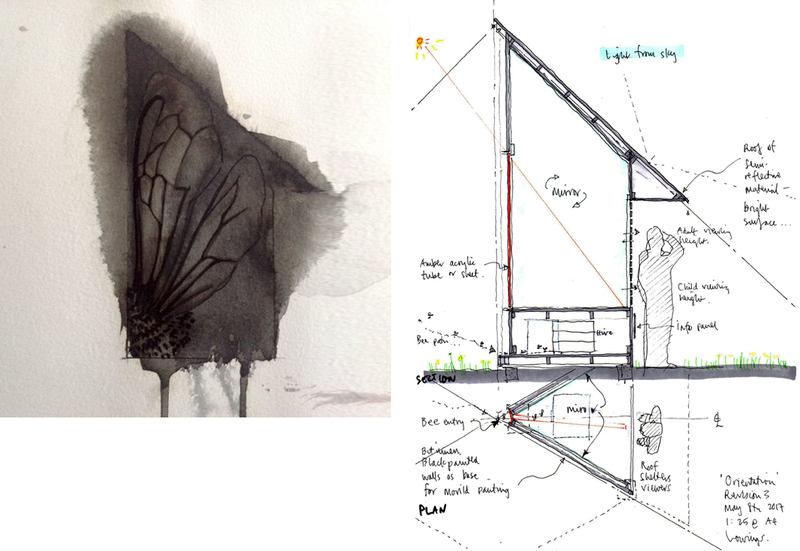 Subtle bee wing and flower paintings by Marianne Morild in dripping black gloss oil-like paint adorn the outside. 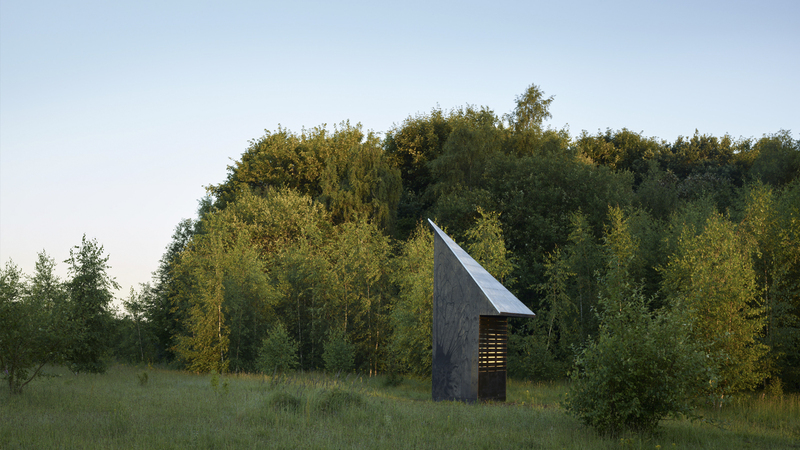 As human visitors approach the simple monolithic blackish triangular structure, it gives no hint of its interior until they are drawn to the side of the structure – sheltered by an overhang – where gaps in the horizontal boards allow viewers to see inside. 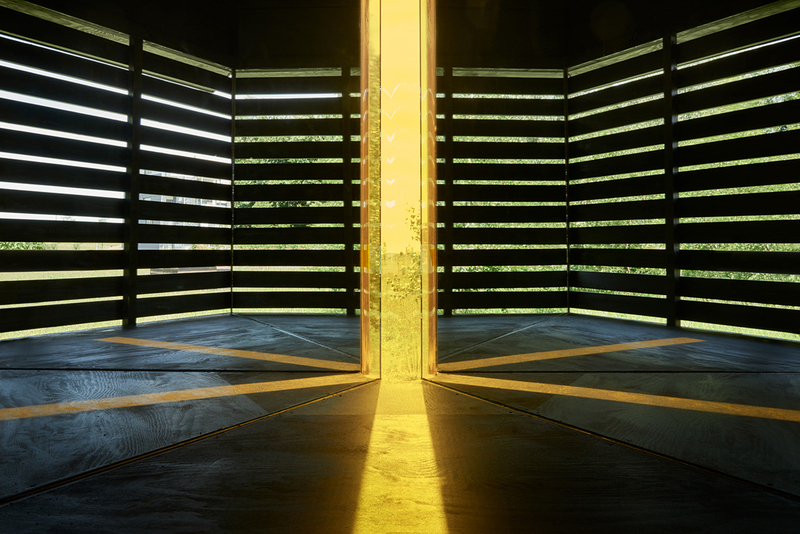 Enclosed is a darkened space which – through the use of reflective surfaces – is transformed into a hexagonal ‘cell’ with what appears to be a glowing vertical column of amber light at its centre. The illusory space refers to the dark interior of a hive and the light column refers to the central significance to the bees of gravity and the position of the sun. The light column emits six beams of light which fall across the floor and all appear to move as the sun traverses the sky. Only one beam indicates the true direction of the sun. The timber roof is waterproofed with a simple metal sheet surface, and overhangs the wall with the horizontal boards to provide a simple shelter for people viewing the piece. The sides of the structure are waterproofed with wood preservative (approved for sale in Sweden to the general public), the heavy smell of which evokes the toxicity of the neo-nicotinoids which kill colonies by interfering with the bee’s ability to ‘remember’ where they are, relative to food sources. The relationship of humans to the land has shifted profoundly as they have moved from a direct dependence on the land to being a majority urban population. Humans have become detached from specific landscapes, and can no longer identify with places in the direct and practical way that their ancestors did. For orientation they can rely only on physical relationships of culture and habit and the macro-natural world (weather, seasons, the sun itself). In an analogous way, bees can be moved as a ‘community’ and re-orient themselves by the diurnal rhythm of the sun. Visitors are not able to enter the two-metre equilateral triangular building. The structure is a simple stick-and-panel timber construction on a baseplate attached to buried pre-cast concrete foundation blocks. One wall has open horizontal boarding and the two other walls are opaque timber boards on a timber frame with an interior of glass mirror. Bees are included as part of the exhibit in collaboration with a local beekeeper – a hive is temporarily brought into the base of the structure for the duration of the exhibition. The bees enter at the foot of the tip of the triangle, away from the viewing position. 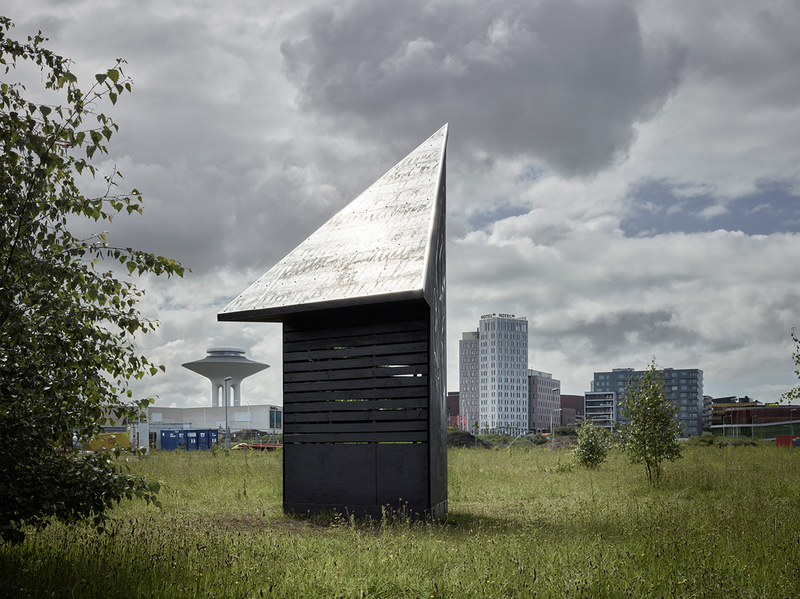 ‘Orientation’ has been acquired by the City of Bergen, Norway, where in it will become part of a newly created Sculpture Park Trail in early 2018.